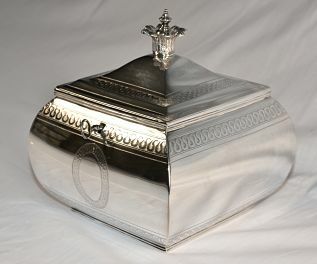 of square cushioned form, hinged domed lid with feather adorned finial, decorated with engraved scrollwork friezes and with a vacant cartouche at the front. 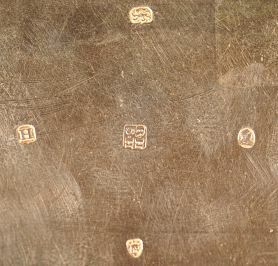 There is a full and clear set of hallmarks to the base which have been photographed individually as shown below. The makers mark and lion passant are also displayed inside the lid.